Escape from civilization to the endless plains of the Masai Mara. Mara North Conservancy is a beautiful private wilderness area of more than 74,000 acres. It is home to a spectacular array of plants, reptiles, birds and mammals; including elephant, rhino, buffalo, lion, leopard, cheetah and large concentrations of wildebeest, zebra, gazelle and other migratory wildlife. Fall in love endlessly. Upon arrival at Nairobi International Airport, you will be collected by our driver and transferred to the domestic Wilson airport for your flight to the Masai Mara. The next few days are going to be replete with fun and adventure and surprises around every corner. We are not going to specify the day by day activities (they are mostly interchangeable), but weather permitting, you will get a chance to do all of the included activities on one day or another. We have included every possible activity into this itinerary so that you get a true sense of the Mara in all her magnificence. The wildlife in the Mara is so spectacular that these 6 days will be rush by in a blur… we promise you that! Losokwan Camp is an authentic Kenyan safari camp offering the perfect base from which to explore the surrounding Masai Mara wilderness without compromising on comfort or responsive service. 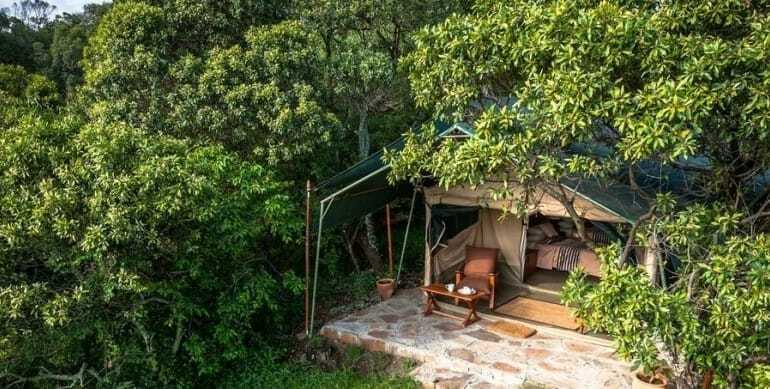 The camp is small and intimate and is located in Lemek Conservancy just north of the Masai Mara game reserve in arguably one of the best wildlife viewing areas of the Masai Mara ecosystem. Losokwan is the Maasai name for Buffalo. Our Conservancy offers hard-hitting game-viewing throughout the year and comprises open savannah and a treelined section of the Mara river with high concentrations of plains game and the wildlife numbers are particularly intensified during the annual wildebeest migration. Activities include: night and day game drives, balloon safaris, bush meals, bird watching, guided bush walks, visits to the local Maasai peoples homes, visits to the OlChorro Rhino sanctuary, Sundowners, picnics and more. For a detailed itinerary with accommodation details and pricing, please contact us by clicking on the “Enqire Now” button below. Mara North Conservancy is a beautiful private wilderness area of more than 74,000 acres. It is home to a spectacular array of plants, reptiles, birds and mammals; including elephant, rhino, buffalo, lion, leopard, cheetah and large concentrations of wildebeest, zebra, gazelle and other migratory wildlife. Leopard Gorge, in the heart of the conservancy, is famous as the setting of countless BBC Big Cat Diaries and National Geographic documentaries. Bordering the Masai Mara National Reserve, the conservancy is vital for sustaining the famous Serengeti wildebeest migrations and the highly threatened African wild dog and black rhino. This is a fly-in safari beginning in Nairobi, Kenya. Flights from Nairobi to the Mara are included.